As an impurity in biogas, dimethylpolysiloxanes present a problem for the efficacy of electric generators, heat exchangers, and emission controls in line with the fuel stream. High performance, near real time analysis is crucial to ensuring complete removal of siloxanes. Detection of volatile polysiloxanes in anaerobic digester and landfill gases is a difficult analysis in gas chromatography. Sticky analytes must be concentrated into a small volume to enhance detection. A very large number of possible organics (>300) must be “fully” resolved to avoid improperly assigning concentrations from overlapping peaks. The Lotus On-Line Trace Siloxanes Analyzer is designed to measure nearly all volatile siloxanes from tetramethyldisiloxane to dodecamethylhexadisiloxane (D6) at levels typically below 0.0001 ppm V/V to over 50 ppm V (400 ml injection and 49:1 split). Samples are loaded through a 16-position automated sampler and trapped onto a low-volume adsorbent trap, with a fixed volume sample loop to ensure accurate volume samples for samples with high levels of methane and carbon dioxide. 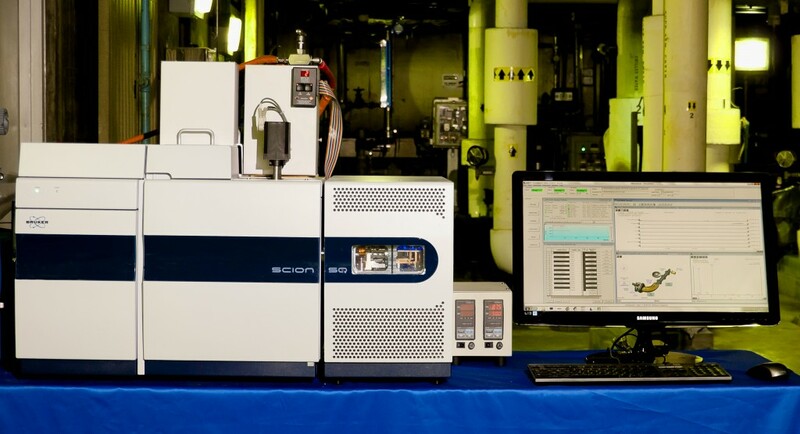 Identification and detection is facilitated with the extremely sensitive Bruker SCION SQ MS. The system involves an air-cooled adsorbent trap, 6 automated valves, two independent column ovens, a thermal conductivity detector, 16-position automated sampler, and one workstation. All of these operations utilize nearly all of the powerful and comprehensive capabilities of the Bruker 451, Bruker SCION SQ MS and Bruker MS Workstation 8.